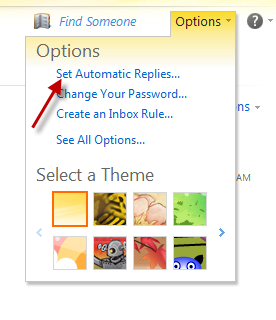 If you need to setup automatic replies for your SureMail™ you will first need to login to your Outlook Web App (OWA) at https://outlook.suretech.com/. Once you login click on Options at the upper right hand corner and select Set Automatic Replies... from the drop down list. In the Automatic Replies page, Don't send automatic replies should be selected and the rest of the screen is grayed out. Select Send replies only during this time period and choose a start time and end time. If you do not choose a time period the automatic replies will be sent out indefinitely until Don't send automatic replies is selected. Compose your message in the text box and format it in any way that you would like. Once your message and message settings are setup you are done. Automatic messages will be sent out during the time period you set. To turn this off select Don't send automatic replies.